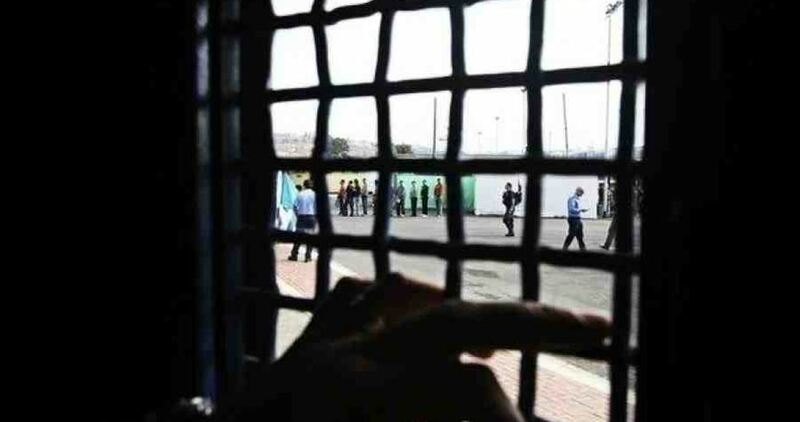 Israeli soldiers attacked, on Saturday evening, Palestinian detainees, held in Section 14 of Nafha Israeli prison, the Palestinian Detainees’ Committee has reported. The committee stated that dozens of soldiers, including Special Forces of the Israeli Prison Authority, broke into section fourteen and used excessive force against the detainees, wounding eight of them. The Prison Administration also imposed sanctions on many detainees in the invaded section of the prison. Such sanctions mainly include forcing many into solitary confinement, usually for extended periods, which also means denying them the right to family visits, and even forbidding them from meeting with their lawyers. 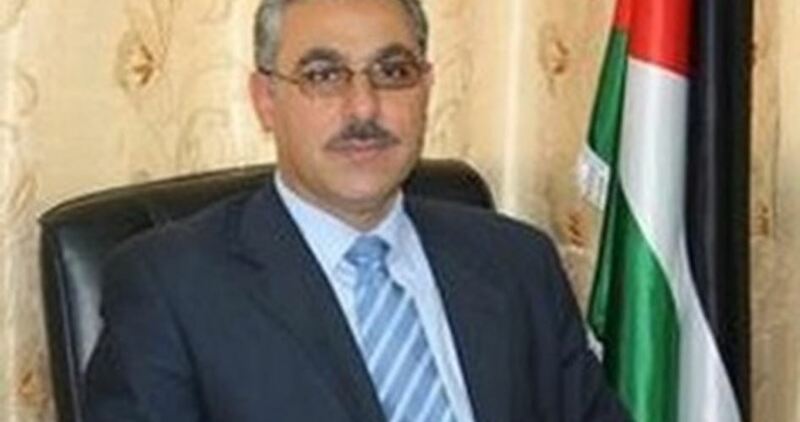 The Israeli occupation authorities (IOA) sentenced the member of the Palestinian Legislative Council (PLC) Ibrahim Dahbour to an administrative prison-term, with neither charge nor trial. According to the Change and Reform parliamentary bloc, the IOA issued an administrative sentence against Dahbour for an undefined period of time. MP Dahbour was kidnapped by the Israeli occupation forces on March 22 at a makeshift checkpoint set up near Arraba town, southwest of Jenin, in the northern West Bank. The Israeli soldiers also seized his car, before they dragged him to unknown destination, Dahbour’s daughter Rahma said. 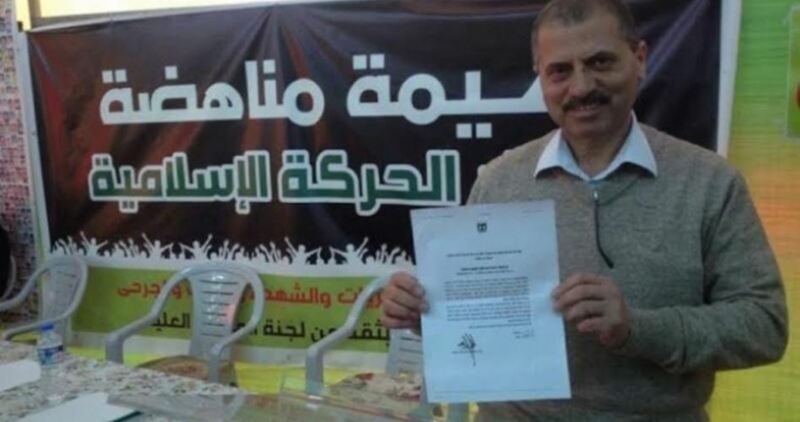 Two Hamas representatives at PLC were recently arrested by the Israeli forces: Samira al-Halayka, arrested at her family home on March 9, and Mohamed al-Tal, arrested on March 21 at his family home in al-Khalil. 12 Palestinian MPs are held in Israeli lock-ups, among whom Marwan al-Barghouti, sentenced to five back-to-back life-terms, and Ahmad Saadat, serving 30 years in Israeli prisons. The list also included 10 MPs from the Change and Reform bloc. 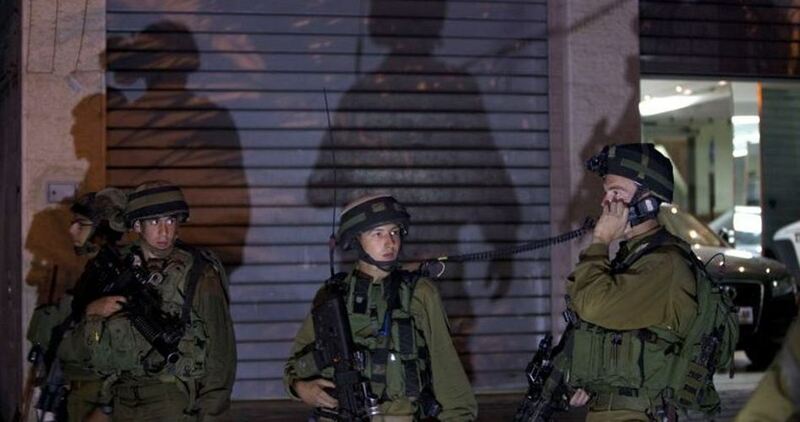 The Israeli occupation forces on Sunday evening kidnapped a Palestinian young man from Zaatara checkpoint, south of Nablus. 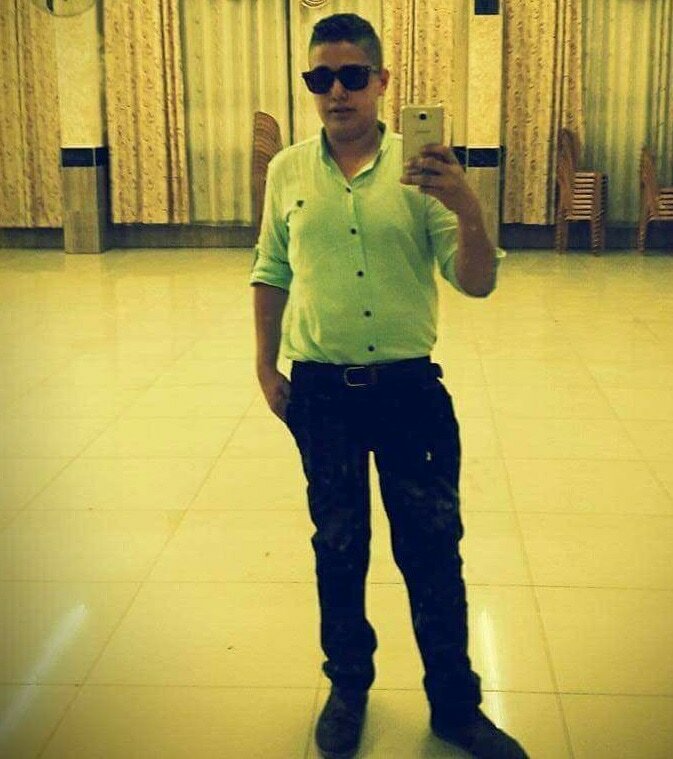 35-year-old Mohamed Abu Za’bal, from Balata refugee camp, east of Nablus, was kidnapped by an Israeli undercover unit at the Zaatara military checkpoint, in the northern West Bank, his brother told the PIC. Abu Za’bal is an ex-prisoner who had spent several years in Israeli jails. He works with the Palestinian Authority police force. Israeli Occupation Forces (IOF) arrested on Sunday evening a Palestinian young man in Qalqilya city, in the northern West Bank, for allegedly trying to carry out a stabbing attack. Israeli 0404 news website claimed that the detainee tried to stab an Israeli female soldier by a screwdriver. The Israeli police at dawn Sunday arrested Suleiman Aghbariya, a senior official of the Islamic Movement (the northern branch) in Israel, from his home in Umm al-Faham City. Local sources said dozens of Israeli police and security officers stormed the house of Aghbariya in the city and arrested him, claiming his detention was part of investigations, without providing further details. The sources added that the police talked about their intention to arrest others from the Islamic Movement. Last week, the Israeli police arrested four activists from the Islamic Movement, including Firas al-Omari, whose detention was extended until Monday, April 3. In this regard, the police placed a gag order on the publication of news about the recent arrest of Islamic Movement activists. The Israeli security authorities have embarked on arresting activists from the northern branch of the Islamic Movement following the right-wing government’s decision to classify it as a banned group in November 2015. The northern branch of the Islamic Movement and its members are known for peacefully defending Jerusalem and the Aqsa Mosque against Israel’s violations. Since March 21, the Israeli occupation authorities (IOA) issued administrative sentences, with neither charge nor trial, against 46 Palestinian detainees, including an MP, a lawyer said Sunday. Lawyer Mahmoud al-Halabi, from the Palestinian Prisoners Society (PPS), said the IOA issued 46 administrative terms against Palestinian detainees held without charge in Israeli lock-ups. He added that the IOA sentenced the Palestinian MP Mohamed Ismail al-Tal, from al-Khalil, to a four-month administrative term. Al-Tal served earlier sentences behind Israeli prison bars under administrative detention. The list also included 14 orders against Palestinian ex-prisoners. Administrative detention is a policy implemented by the Israeli authorities which allows the incarceration of Palestinians without charge under the security pretext. A round of home break-ins and arrests were reported at daybreak Sunday as the Israeli occupation forces (IOF) rolled into West Bank provinces. Reporting from al-Khalil, in the southern West Bank, a PIC news correspondent said the IOF rolled into Bab al-Zawia and al-Shuhadaa Street in several army jeeps and bulldozers and leveled Palestinian lands. The IOF also wreaked havoc on civilian homes in al-Khalil and handed interrogation writs to two Palestinians civilians from al-Zgheir family. 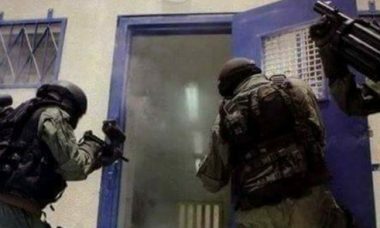 Overnight, the IOF, onboard seven military jeeps, stormed the vicinities of Tareq Ibn Ziad School, in al-Mashareqa Neighborhood, and ravaged Palestinian commercial shops. Three Palestinian ex-prisoners were kidnapped by the occupation forces from their homes in al-Khalil’s northern town of Beit Ummar. Activist Mohamed Awad identified the arrestees as 24-year-olds Muntassar Awad and Ibrahim Abu Diyeh, along with Youssef Ikhleil, 35. According to Awad, 46 Palestinians, mostly youngsters and minors, have been kidnapped by the IOF from Beit Ummar since the start of 2017. 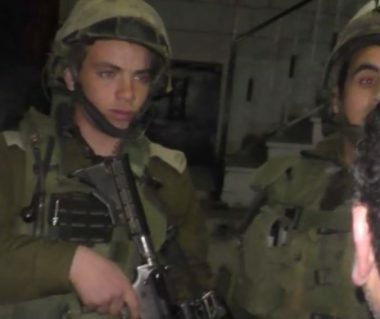 On Saturday evening, two Palestinian youths—Mohamed Abu Akr and Majdi al-Natsheh—were kidnapped by the Israeli border cops near the Ibrahimi Mosque, in the Old City of al-Khalil, after they had been subjected to heavy beating and to strip searches on suspicion of holding knives. The Israeli radio said five Palestinians were arrested by the army forces. The list included two youngsters in their early twenties from Bethlehem. Meanwhile, 15 Israeli patrols stormed Nablus province and cordoned off the family home of the slain Palestinian youth Ahmed Ghazal, fatally shot by the Israeli army in Occupied Jerusalem on Saturday. Ghazal’s family members had been subjected to exhaustive interrogation in the process. At the same time, the IOF stormed the environs of the An-Najah old campus and closed al-Bukhary bookshop owned by prisoner Alaa al-Tirawi, who was arrested on October 5 on account of his affiliations with Hamas resistance group. The closure is to be in effect until May 31, 2017. Clashes reportedly burst out in Qalqilya’s eastern town of Gios moments after they IOF stormed the area and attacked the Palestinian anti-occupation youth with randomly-unleashed spates of teargas canisters. A military checkpoint was further pitched by the Israeli forces at the main entrance to Azzoun town, where Palestinian vehicles and civilians had been made to endure intensive searches. The assault culminated in the abduction of youngster Othman Redwan from Azzoun at predawn. 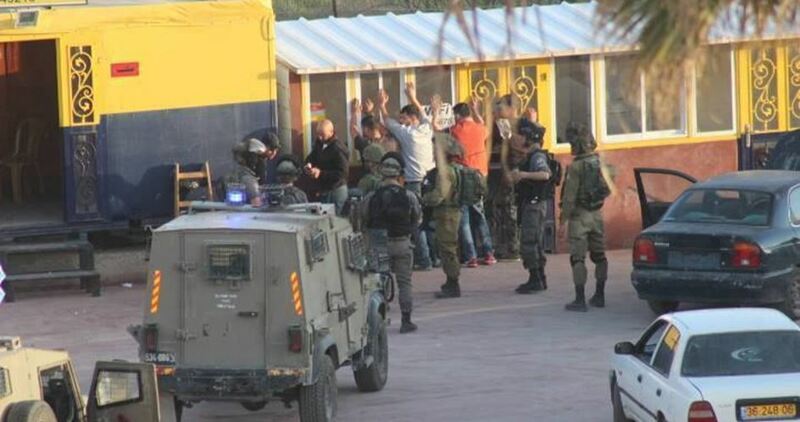 Several Israeli military jeeps invaded, on Sunday at dawn, Beit Ummar town, north of Hebron, in the southern part of the occupied West Bank, violently searched homes, causing excessive damage, and abducted three Palestinians, including two former political prisoners. Media sources in Hebron said the soldiers invaded many homes in the areas of Safa, al-Bayyada, and ash-Sho’ab, and that the soldiers destroyed a closet in the house of Yousef Bader Ekhlayyel, 36, and abducted him, before confiscating clothes, including a winter coat belonging to his child, Ammar, only 7 years of age; Ekhlayyel is a former political prisoner, who was held by Israel for four years. The soldiers also abducted two former political prisoners, identified as Montaser Abdul-Hamid Mheisin, 24, and Ibrahim Khalil Abu Dayya, 24. Furthermore, the soldiers invaded the home of Mohammad Sa’adi Ekhlayyel, and violently searched it, before confiscating his ID card. A Palestinian youth was shot dead on Saturday afternoon by Israeli gunfire in the Old City of Occupied Jerusalem after stabbing two Israeli soldiers. Israeli channel ten announced the injury of two soldiers, while, Israeli police spokeswoman Luba Samri said a stabbing attack was carried out and the stabber was under control. Palestinian Health Ministry announced later on the martyrdom of a Palestinian young man, who was not identified yet, after being gunned down by Israeli forces in al-Wad Street in Occupied Jerusalem. Israeli police who closed all the roads leading to the scene are still investigating in the anti-occupation stabbing attack. Israeli police officers shot and killed, on Saturday afternoon, a Palestinian teenage boy from Nablus, in the northern part of the West Bank, after he reportedly stabbed a police officer and two other Israeli settlers, in the al-Wad Street, leading to the Al-Aqsa Mosque, in occupied East Jerusalem. The army later forced all stores shut, and abducted 20 Palestinians, including 17 merchants. 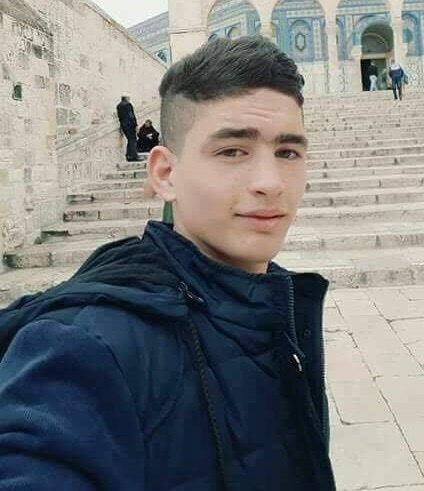 The slain teen has later been identified as Ahmad Zaher Fathi Ghazal, 17, from Nablus city, while Israeli sources said that one police officer, was moderately injured, and two Israeli civilians, 18 and 23 years of age, suffered mild wounds in the incident. Following the incident, the soldiers closed Bab al-‘Amoud, leading to the Sahera Gate and al-Waad Street, before calling for reinforcement, and imposed a tight siege in the area, preventing the Palestinians, including journalists, from entering. Israeli Occupation Forces (IOF) rounded up on Saturday evening a Palestinian young man near Kiryat Arba settlement close to al-Khalil for alleged knife possession. The Israeli radio reported that IOF soldiers suspected a Palestinian man, who was not identified yet, before arresting him and taking him to an investigation center. 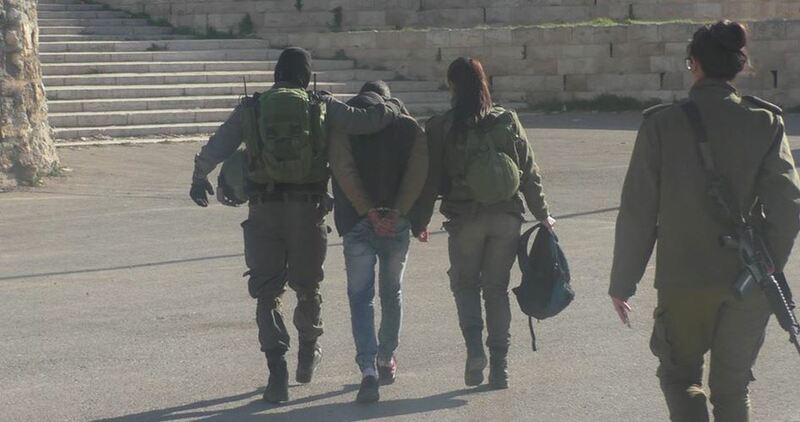 The IOF soldiers have recently escalated arrest campaigns against Palestinians while being close to settlements over claims of attempting to carry out anti-occupation attacks. In many cases, the IOF troops committed field executions against Palestinian youths just for approaching settlements or Israeli roadblocks. 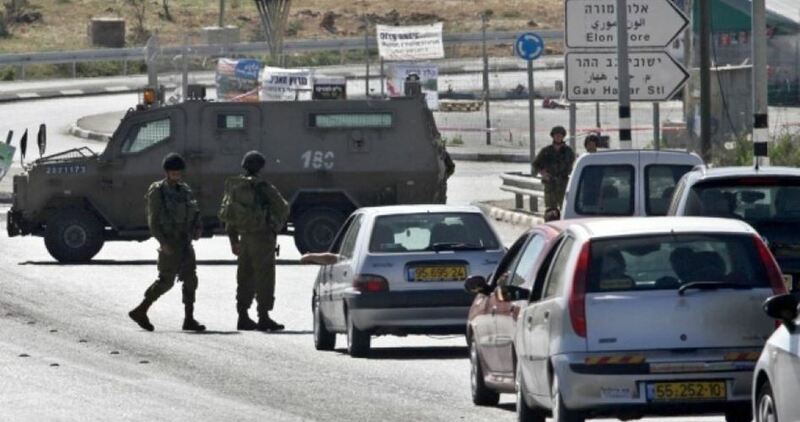 Israeli soldiers abducted, on Friday evening, a young Palestinian man, after stopping him at one of the military roadblocks, surrounding the Ibrahimi Mosque, in Hebron, in the southern part of the occupied West Bank. Media sources said the soldiers stopped the young man, from Yatta town near Hebron, after he panicked when they shouted at him to stop while he was casually walking near them. The soldiers then searched the young man and abducted him, after alleging that he carried “a small plastic blade,” in one of his pockets. The soldiers cuffed and blindfolded the young man, whose name remained unknown, and took him to a police station near the mosque, for interrogation. Israeli soldiers shot and injured, on Friday evening, a Palestinian child, near Ni’lin village, west of the central West Bank district of Ramallah, and abducted him without allowing any Palestinian, including medics, to reach him. The Israeli army claimed the soldiers fired live rounds at several Palestinians, who reportedly hurled Molotov cocktails at army vehicles and colonialist settlers’ cars. The soldiers closed the entire area for all Palestinian traffic, and prevented Palestinian ambulances and medics from approaching the wounded child, and later took him to an unknown destination. The extent of his injury remains unknown. Furthermore, the army installed a military roadblock at the main entrance of Ni’lin village, and prevented the Palestinians from entering or leaving it.